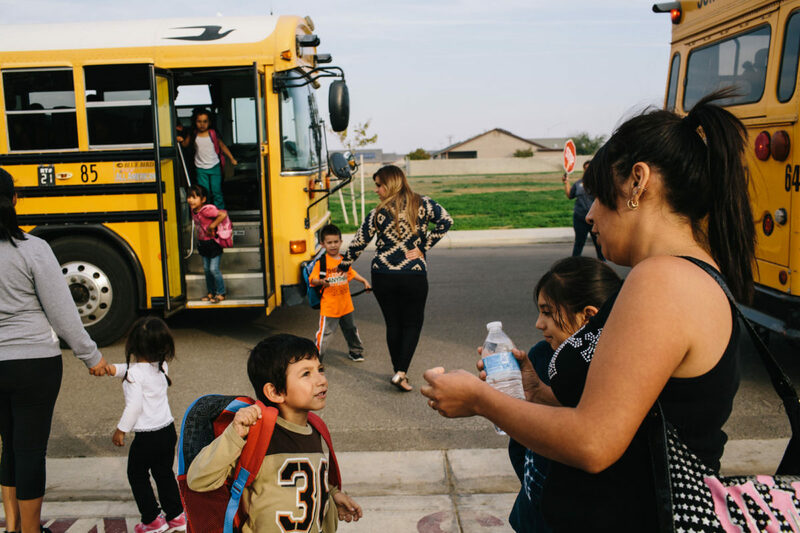 Leticia Ramirez picks up her children from the school bus in the Parkside neighborhood of Madera in California’s Central Valley. Clean energy saves money for a working family and helps clean the air in their neighborhood. Leticia Ramirez rolls masa into round balls of dough over the sink in her small kitchen in the Parksdale neighborhood of Madera, a short drive north of Fresno. The home she moved into with her family three months ago, in August 2014, still looks a little sparse and very freshly settled, but tidy and nice. She says in Spanish that she is slowly trying to decorate. Framed photos of her children hang on one wall. The corner nearest the kitchen is home to a small shrine with a bright pink, orange and green ceramic statue of Our Lady of Guadalupe. A glass pedestal plate on the kitchen table holds a cluster of fat red grapes from the nearby vineyard where Leticia’s husband, Gerardo, works driving a tractor. Leticia helped build the home herself, along with her family, volunteers and construction staff from Self Help Enterprises, an organization that uses state government and private funding to bring housing and services to low-income people in the San Joaquin Valley. Self-Help allows families to use their “sweat equity” as the down payment on the new home they otherwise could not afford. On the next street over, five houses in a row have solar panels on their roofs. Today, volunteers from a local solar installer—Lifestyle Solar—are working with the Central Valley office of GRID Alternatives to install a 3kW solar system on Leticia’s and Gerardo’s home. GRID Alternatives is a national nonprofit that provides job training in solar installation and no- to very-low-cost solar for qualified homeowners. Solar power was once associated with affluence, but state programs and policies are bringing solar to unexpected places. And this is just the beginning. By charging polluters and putting that money to work bringing clean energy to low-income families and jobs to communities that need them, California’s effort to combat global warming is helping families and neighborhoods up and down the state. Leticia married Gerardo when she was 16 (she’s 37 now). They came here to Madera from Michoacán, because Gerardo’s parents were here. They’ve now lived in Madera for 22 years. Gerardo says that after all these years it’s really lucky that he can participate in this program and have something of this magnitude. “We are very happy because through GRID we are going to be able to get a solar system that is going to help us save energy as well as money so we can use it to do things that we could not do before financially,” Gerardo said. Friend and neighbor Maria L. Enriquez has come today to help with the cooking to feed the solar crew. Leticia hands Maria the balls of dough, the size of tennis balls, and Maria places them between a folded piece of plastic on a large wooden tortilla press. Alicia Bohigian, outreach manager for GRID Alternatives, translates but Maria understands the questions. Maria got solar on her nearby house last year through the same program, and she has stayed involved. She always shows up to volunteer with cooking or whatever is needed when another neighbor is getting an installation. Maria’s family’s annual electricity cost dropped to just $85 a year after they got the panels, she says. That’s with four people in the house. She used to have six people in the house. (Two of her children got married, Alicia explains.) Alicia says GRID Alternatives works with the homeowners to install CFLs and Energy Star appliances to further reduce energy costs. Cooling bills in this Valley, with many days over 100 degrees, are expensive, even unaffordable, for many families here. GRID estimates that Gerardo and Leticia could save up to $25,000 on electricity over their lifetime, thanks to the solar installation. But solar in the Central Valley has another benefit beyond a reduced electricity bill. Like many residents here, Maria suffers from allergies and asthma, and today is what the local weather forecasters call a bad pollution day. The American Lung Association named the Fresno/Madera area as the most polluted city in America for particle pollution and fourth worst in America for ozone pollution in its 2014 State of the Air Report. The increased use of solar not only saves people money, but also reduces emissions and pollution in the Valley. GRID’s average 3kW solar installation keeps 79 tons of carbon emissions out of the atmosphere. As Maria and Leticia talk, the tortillas heat up and begin to smell of warm corn. Leticia and Gerardo’s two daughters, Karina and Yadira, sit nearby on the sofa and watch daytime TV with their grandmother, Maria Alejandre. The girls chat in Spanish and scroll their phones. Gerardo and Leticia have four kids, ages 20, 16, 8 and 6. I ask Karina if she knows how to make homemade tortillas, and she says she doesn’t.